Yeay! Night after the successful April Fool Touge, another touge event came-out! After long period Touge-R has been sleep, his leader names shalie planned for an Midnight Event. 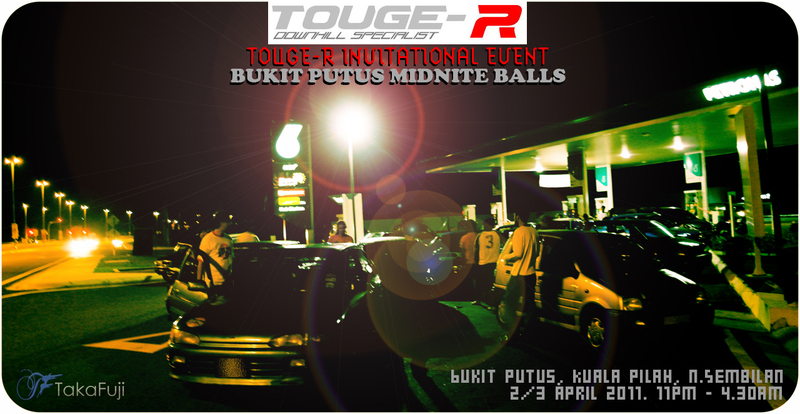 The course is not at K. Kelawang, but Bukit Putus has been selected for the night or April 3rd. The event has been post 3 days before at chat group for invitation to outsiders. The violet told me, “i wanna go” but i leave her rest at home for KKb drive on next morning for “Trekking in da Jungle“. I ask jasril for the event, and he say YES to go. Krul Saga also participated in this event. But after he went to carwash for clean-up, got some minor problem with his engine. Couldn’t Start in dealine =.=! So jasril and me go 1st to Kole Pilah via Lekas Highway, while Krul settle up with his friend and bit late. On the cruising at Lekas, there was Fatal Crashed happened with an Iswara. Fire Truck and fireman has been called out, oil was spilled on Lekas Tarmac. The driver is Iswara passed away. Dont know how that incident happen. Story by kudut, that was drunk driver. First heat was start, led by Angelic while others try to keep it up. Action to action has been record, due to very dark scene, unable to do some photoshoot around corner. If there is 2 camera with us at the corner, sure can snap some ;). Manveen also drive fast that night. Superb Myvi driver. With auto transmission beb. Salutee! Botak Traffic take his leave after lepak at mamak, he need to back early to get some rest because have a program next morning. We headed back to our arena but not to do some run, but lepak at top. Everyone was enjoyed that night, we all kacau2 some of Mat Motor from hill. A lot of fun that time. Laughing non stop! After an hour lepak on the hill, time to downhill with all driver and back home. KE70 and Starlet together with us went downhill. Led by Angelic, chased by 120y, Krul saga, starlet, Ke70, and kancil. Shalie went fast on the dowhill until he disappear from our sight. Krul car was tend to understeer many times, his tires not good in traction. 2ndhand Dunlop Formula with 30% tread just bought last morning. So a bit hard .. huhu.. KE70 driver names as Pizan Purple done some little drift outhere while downhill. Starlet was in good handling i saw from behind, Amer kancil also show his best that night for downhill attack. Finished the downhill, we stop-by after T Junction and salam2 before head back home. 120y, Saga and white kudut kancil was on same route heading Lekas Highway, Shalie and Bill donno where they headed.. haha . Wokey! Thanks for the invitation. Great Run! Lepas ni leh buat TougeMag.. hahaha!